Currently I subscribe to three beauty boxes, Julep, Beauty Box 5 and Topbox and of the three, only BB5 and Topbox are 'mystery' boxes. I may not be thrilled by Julep every month, but I know what I'm getting. With BB5, I may not know exactly what I'm getting but they always have at least one or two products that are in EVERY kit, but with Topbox? Topbox is always a gamble. What is a Topbox Privé box? Each month Topbox has several special (Privé) boxes and a regular box. They send a survey near the end of the month asking you to 'list' the Privée boxes you're interested in, and you stand a chance at winning one of them. This month I listed the Benefit Gimmie Brow, Cake Dry Shampoo and Glamglow, and I lucked out! Not only did I the Glamglow, but they remembered to put my three replacement samples in the box too. My full selection of products! GlamGlow's YouthMud is one of those aspirational products that everybody swear by, but has a high entry-point to even test out. I was surprised to see it in the Privé offerings twice in only a few months and was happy to receieve it this month. A staple in many beauty arsenals, this tingly mud mask runs for $21 CAD. Shu Uemura Skin Purifier came at a good time, as I'm almost finished with my Dermologica cleansing oil. I've become really attached to oil cleansing products as I feel they leave my skin clean but not squeaky-dry clean. I would never try this product out without a sample, as the price is slightly higher than I'd spend on an oil cleanser, so I'm glad to give this a whirl. It has a light citrus scent and does the job well. This product also looks like it has been discontinued however, so I'm not sure about buying it in the future. This 20ml sample costs about $4 CAD. I'm really happy with the colour of my Ceramic Glaze nail polish but I've never seen Ceramic Glaze before! Rumours abound on the interwebs that this brand is China Glaze's custom polish for Shoppers Drug Mart but I'm not sure. The colour is a cheery aquatic blue that dries with a really cool matte finish. But if you're not a matte polish fan, it also takes to glossy topcoat really well. This runs for $10.99 CAD. 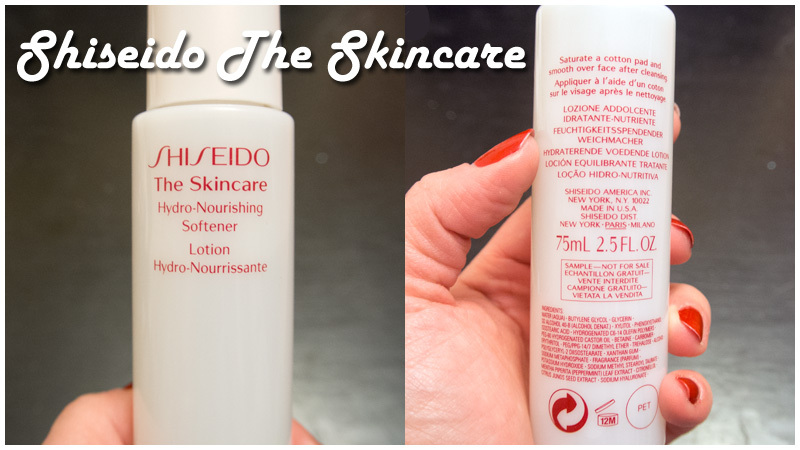 Shiseido The Skincare Softener is an interesting selection in my box, as I don't know EXACTLY what it's for. The instructions say to use it after I cleanse my face, on a cotton pad, but is it a toner? A pre-moisturizer moisturizer? It feels nice to apply, it's very gentle on the skin and has a slightly goopy consistency that sits lightly on the skin before absorbing. I went to find more information but it looks like this product is ALSO being discontinued. 75ml is about $22 CAD. I'm pretty happy with this box. These replacements more than make up for last month's 'anti-aging' debacle, and give me the true deluxe samples that I was promised when signing up for Topbox a few months ago. This is the first box I feel is really high-end, which is the reason I subscribe to them in the first place. How cost effective was this box? This month's Topbox cost me $13.56 and resulted in approximately $57.99 CAD in actual, useful products that don't have hyper-inflated prices! Each sample provides a decent amount of product to test out and use to determine if I'll buy it in the future. The only problem? Two of the products have been discontinued. Odd to receive products to test out if there isn't any chance of repurchasing them. I'm happy with the value however, but it's worth noting. How did you fare with Topbox this month?